There aren’t many luxury hotels that have a woman behind the brand. The Mansion on Turtle Creek became Caroline Rose Hunt’s first Rosewood hotel in 1980, a project she developed with her children. She is a Dallas icon and daughter of H.L. Hunt, a 1930’s oil baron who spent the latter part of his life as the wealthiest man in the world. The Mansion, as it was called long before its life as a hotel, sits discretely in the uptown Dallas area that shares its name. Winding down Turtle Creek Boulevard from nearby Highland Park and turning into its glamorous circle drive is really one of the most definitive pilgrimages in Dallas for both residents and visitors. It is the last place you want the rental car counter to surprise you with a metallic purple PT Cruiser. Trust me from experience. The Mansion On Turtle Creek entrance today. Curated antiques from Sheppard King’s family’s grand tour of Europe constructed the home, funded by his cotton empire— with fixtures, doors, columns, and marbles from France, Italy, England, and Spain. It later became a home-office for American Liberty Oil Company. Despite its international pedigree, the style and feel are all Dallas: bold, traditional, and personable simultaneously. The lobby of the hotel has expanded over the years, yet my children were able to make a direct route to a cookies and lemonade table. Despite the number of people in the lobby, it retained a calm, hushed environment, since everyone was under the care of such an accommodating staff. “May we bring your children some crayons and movies to your room?” Yes, thank you. 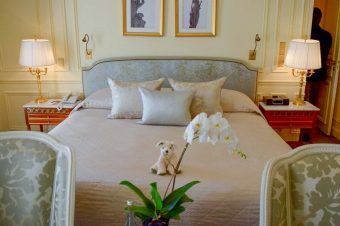 The rooms and suites are beautifully furnished in modern and feminine corals, beiges, and metallics. The canopied king bed elicited a running squeal from my daughter, not unlike the inappropriately named Pig Run on Pledge Day during Rush Week. Don’t worry if you’re lost. It’s a Texas thing. She opened the balcony doors to take in views of the hotel’s property, and the August heat came in. The door rang, and we received the greatest and most needed welcome amenity: Dallas-based Dr. Pepper in vintage bottles, popcorn, grapes, and iced tea. I confess that I don’t let my kids drink soft drinks, so I smiled, “Yum, sparkling iced coffee!” and moved them out of their reach. We snuggled in with a room service dinner of the hotel’s signature tortilla soup and grilled cheese for the kids. It was a very sophisticated grilled cheese. Sometimes kitchens at luxury hotels forget that the children’s menu must be dumbed down to the basics. The hotel offers s’mores at their fire pit, but they apologized that the weather was too warm. They offered us a tasting of house made ice creams and mixed berries instead. Lovely! The next morning, we were told a surprise was waiting for us by the hotel pool. We put on our swimsuits and headed past the fitness center and massage rooms to the pool. The hotel had stacked a variety of inflatable pool toys for the kids and provided boy and girl fins and masks sets. Better yet, a sign welcomed them by name. The pool area is smaller but heated and open year round. They were in heaven, and with it being midweek they had a morning swim to themselves. My son refused to dress back in our room and remained naked but for his new Teenage Mutant Ninja Turtles fins and snorkel. 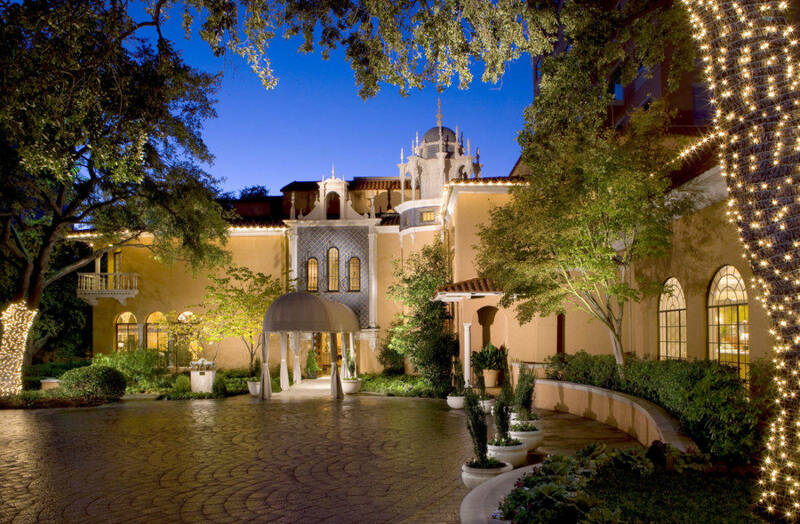 The Mansion on Turtle Creek offers an exceptional level of service. I think five-star service either has two underlying styles, “Welcome to our beautiful property,” or “Welcome to your temporary home.” I am sure that Rosewood excels in the latter better than any other luxury brand because it goes back to implementing a woman’s vision and values for hospitality. It’s personal and comes from a deep understanding of what it means to be a good hostess, too. I think this is why my mother and I considered it our favorite hotel to visit together — though I didn’t understand why at the time. A mother-daughter shopping trip to Neiman Marcus and a night at the Mansion will cure most of life’s small problems. The hotel is a wonderful destination during the holidays where every inch is decorated elegantly. 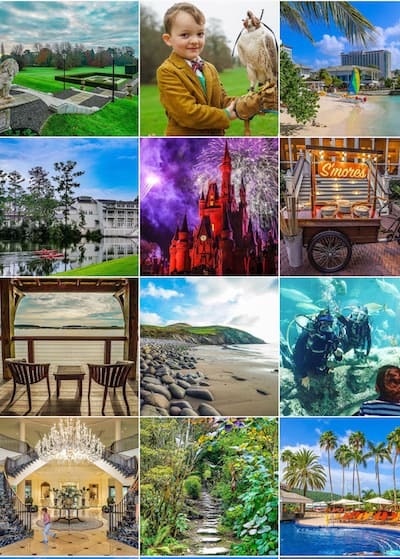 Guests can request their own petite trees for their rooms and suites, and the lobby’s chocolate chip cookies get replaced with holiday treats and cider. The Mansion Restaurant and Bar are two of Dallas’ most adored traditions. The dining room of the residence became the bar, and New York’s 21 Club managed the restaurant during the hotel’s first chapter. The wood-paneled lounge has an intimate and chic timeless vibe; it never was and never will be out of fashion— not unlike the Bemelmans’ Bar at the Carlyle Hotel in New York, another Rosewood property. 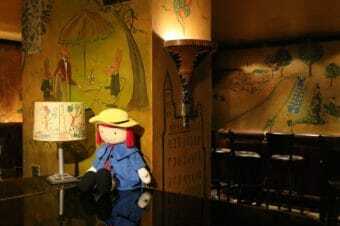 The restaurant showcases many of the previous owners’ European collections. The restaurant’s dining room has stunning stained glass windows bearing the coat of arms of the rebel barons who forced King John to sign the Magna Carta, which is as interesting as it is a little random. For all of the ways that room service wasn’t a home run with my kids, the restaurant was amazing and provided us five-star service and food—an excellent choice for a special meal for any family. My daughter claimed they served the best macaroni and cheese she’d ever had. What made the lunch even better was our server, Barbara, was a mom with grown kids who taught her exactly how to offer support in my distraction efforts to keep a three-year-old boy quiet and in his seat for a two-hour lunch (which I did only with her help). She probably is just as adept with her all-knowing smile and easy manner at handling the most privileged three-martini lunch patrons who get a bit too boisterous. The staff rewarded my children’s good behavior with a three-dish presentation of cookies and ice cream that put huge smiles on their faces. My own halibut with a kefir lime pesto was wonderful, and the restaurant offers house-made macaroons as a popular dessert choice. The chef is French after all. The Mansion restaurant always strives to lead the Dallas culinary scene —and the Texas stage, too—and I recall how amazing former Chef Fearing’s lobster tacos were that I ate twenty years ago. He single handedly put upscale Southwestern cuisine on the table during his tenure as the hotel chef. Before checking out, the hotel asked if my children would like to make their own trail mix to take with us. My son didn’t really understand the concept of a buffet and simply filled the large soup spoons of every nut and fruit offered into his mouth, but it is certainly the thought and creativity to make children feel special that counts. A warning to readers, if you see us on your next vacation at the breakfast buffet, make sure you are in line before my son. A woman from the front desk presented my children with their own Rosebud passports, a coloring and activity book loaded with early indoctrination of Rosewood’s brand loyalty and the ultimate brag book for well-traveled kids to complete. My daughter flipped through it and chose the Rosewood Mayakoba. Her bags are packed. Although we were guests of Rosewood Mansion on Turtle Creek, these opinions are entirely my own. 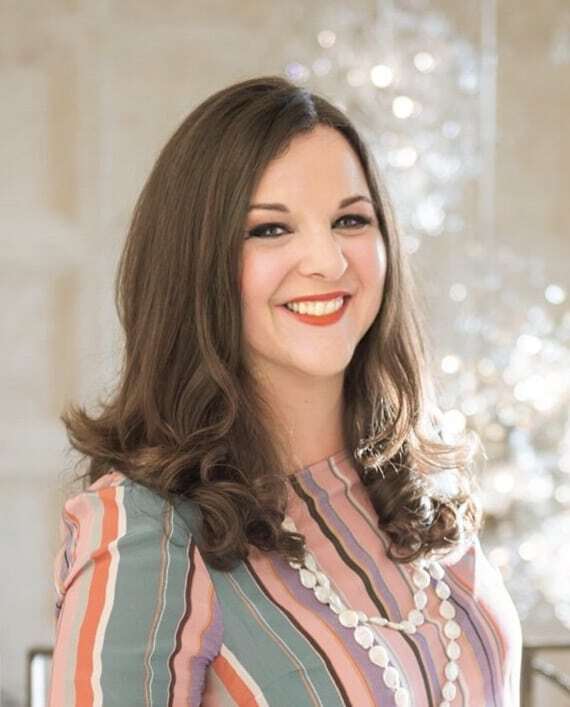 Robin Hutson is the founder of Luxe Recess and a graduate of Southern Methodist University. Her magazine publishing career moved her to the East Coast which made this trip to Dallas all the more special. Awww I didn’t realize you’re originally from Texas but now I realize why this was such a special trip for you. I’d love to spend some time there with my mom 😀 And I must say, I love that you can have a mini tree in your room around the holidays! I only lived in Texas for college, but really fell for Dallas. It is an amazing city unlike any other in the US, or Texas for tha matter. Wow, looks like a beautiful place to stay in Dallas. Love the welcome amenities and the pool! Yes, you should. It was a wonderful tradition for us! This looks like a beautiful place to stay in Dallas! I love how they treated your kids. So very special. We will definitely have to check this out the next time we head to Texas! This definitely looks like my kind of place! Luxurious AND delicious!